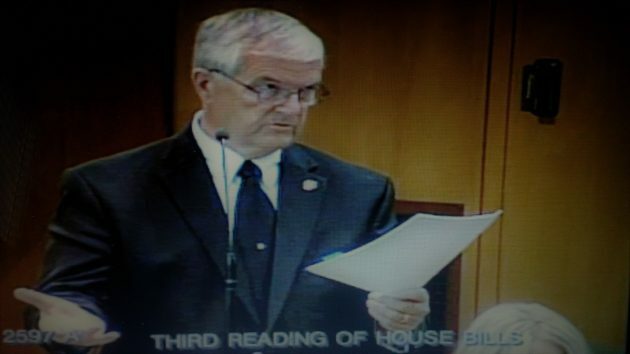 Rep. Andy Olson, R-Albany, carries his anti-distracted-driving bill on the House floor on May 1. The vote, on Monday, was 46-13 to pass House Bill 2597-A, which now goes to the Senate. Olson had been working on the legislation as part of a task force against distracted driving. He carried the bill on the floor, urging his colleagues to pass it as an additional tool for law enforcement. The bill would ban any use of hand-held electronic devices while driving, whether it’s for phoning, accessing the Internet, or anything else. The bill is a response to an appeals court ruling that held current law bans only the use of phoning or texting while driving. The ruling left police no authority to cite anyone for, as an example, uploading photos while driving. Olson said there was still concern about how the bill might affect two-way radio communications by ham radio operators, and he hoped to get that point taken care of in the Senate. Other opponents also worried about the bill’s effect in raising the maximum fine to $1,000 for a first offense. This could cause all kinds of problems for people, they said. But the bill also calls for ODOT to create an education program that first-time offenders could take to avoid the fine. As for all other possible distractions cited by Engel, one representative made a telling point: Oregon traffic deaths were declining for the last two dozen years or so even as traffic and the number of drivers rose, and only in the last two years did fatalities inch upward again. Picking your nose, doing your hair, having lunch and so forth all went on while traffic deaths were going down. The only thing different in recent years is that smart phones came into universal use. Her point: It’s pretty obvious that while many other distractions cause crashes, the worst one is the use of hand-held phones. And that’s what justifies this bill. And as much as I dislike all the laws against doing stupid stuff, I can see the logic here. Include ALL cell phone use by drivers. Period! ALL, including police etc. If it’s that dangerous it should include ALL! Amen to above (Terry). Emergency personnel have no valid reason to be using a computer or cell phone while underway, including being stopped at red lights or stop signs. They have a radio! Check on line for info about emergency vehicles involved in accidents while using cell phones or computers and traveling at high speeds.